The Manatee Works Barcode Scanner SDK is implemented as a software library that provides a lightweight, yet powerful barcode detection and decoding API optimized for mobile platforms. 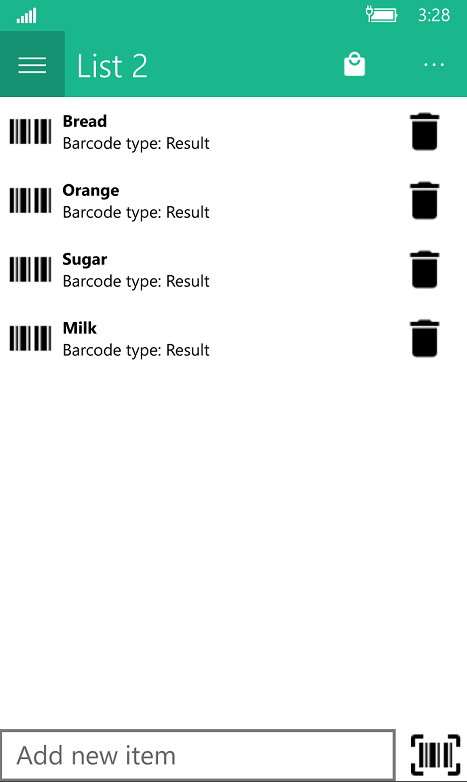 The Barcode Scanner SDK library supports many barcode symbologies and sub-types. The core routines are implemented in a static C library for high performance and portability, and where necessary, native wrappers are provided for the various platforms. Step 1 - Download and install the latest Microsoft Visual Studio and make sure to include all Xamarin components through the installation. Step 2 - Download the Manatee Works Barcode Scanner SDK project from the github repository, and Open file: MWBarcodeLibUniversalSDK.vsix. 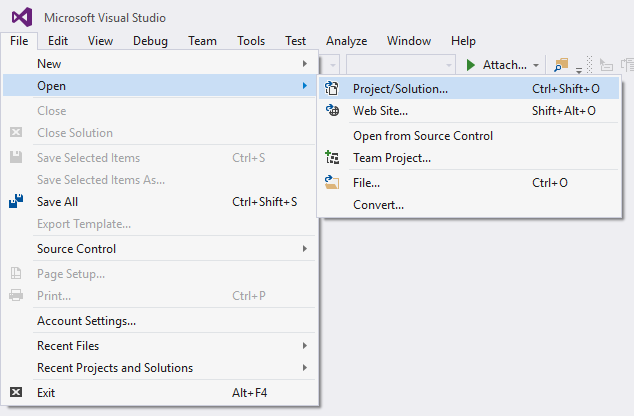 Step 3 - Start Visual Studio and open the solution: ManateeShoppingCart.sln. Step 4 - The Manatee Works Barcode Scanner SDK needs a valid license in order to provide accurate results. 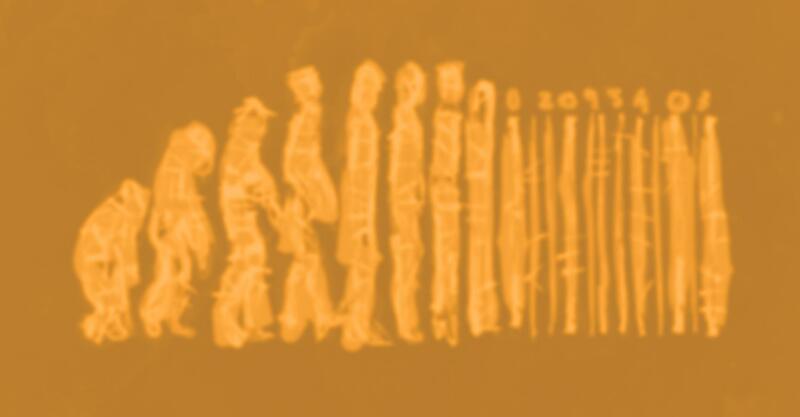 Using the Barcode Scanner SDK without proper licensing is certainly possible, but the results will be masked with random characters throughout the result string. By first registering with the Mantee Works Developer Network you may generate a free trial license, valid for 30 days. Step 5 - With license keys in hand, they may now be entered into each project. Set the startup project (depending on platform) and rebuild the ManateeShoppingCart solution. UWP – This project holds Universal Windows Platform specific code and is the entry point for the UWP application. ScanPageRenderer.cs is a class that inherits from PageRenderer. This class is helping us show activity as a Xamarin.Forms page, in this case this is ScannerActivity.cs. DroidMethods.cs is a class that inherits from the NativeMethods interface that is defined in the portable project. Here we write our native Android methods that can be used in the portable project. DependencyService allows apps to call into platform-specific functionality from shared code. 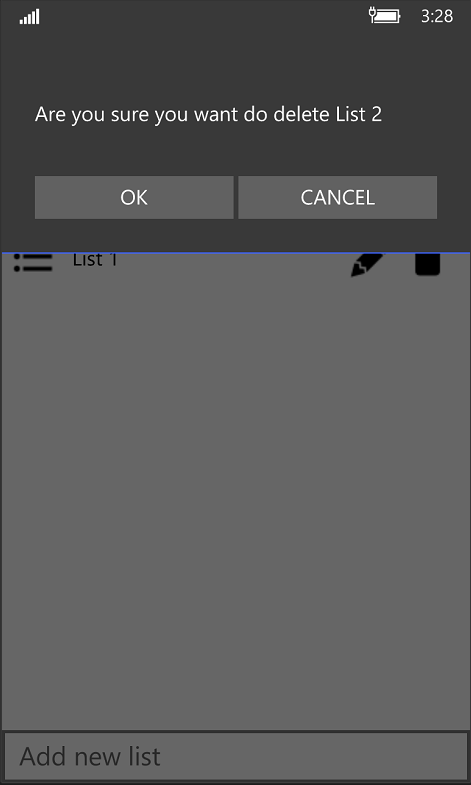 This functionality enables Xamarin.Forms apps to do anything that a native app can do. ScanPageRenderer.cs is a class that inherits from PageRenderer. This class is helping us show UIViewController as a Xamarin.Forms page, in this case this is MWScannerViewController.cs. IOSMethods.cs is a class that inherits from the NativeMethods interface, which is defined in the portable project. 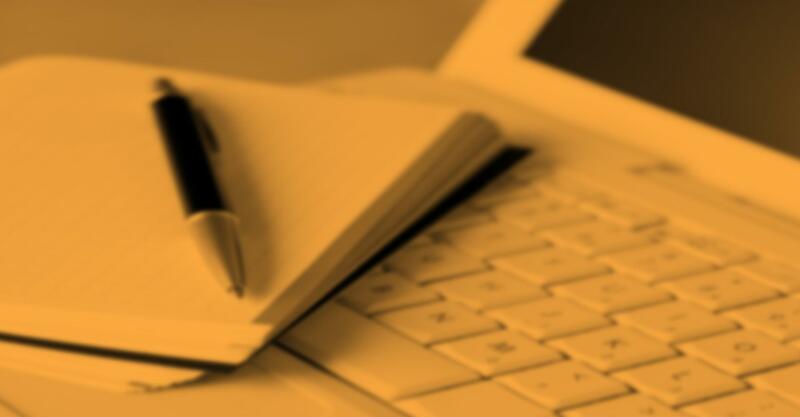 Here we write our native iOS methods that can be used in the portable project. //Display an extended splash screen if app was not previously running. ScanPageRenderer.cs is a class that inherits from PageRenderer. 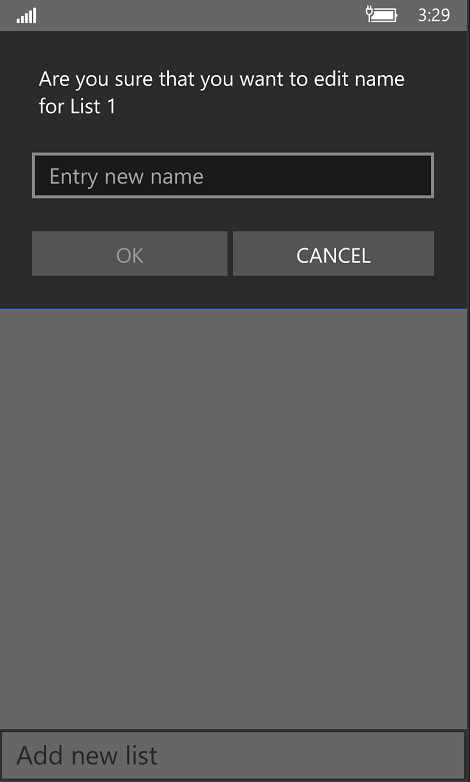 This class is helping us show a UWP native page in Xamarin.Forms page, in this case this is ScannerPageNative.xaml. UWPContentDialog.xaml is a native ContentDialog that will be used in the portable project. In Package.appxmanifest we are setting the app name, description, capabilities (in this case we need access to Microphone and Webcam), splash screen image, app logo, etc. As we already mentioned, Xamarin.Forms is a cross-platform, natively backed UI toolkit abstraction that allows developers to easily create user interfaces that can be shared across Android, iOS and Windows. The user interfaces are rendered using the native controls of the target platform, allowing Xamarin.Forms applications to retain the appropriate look and feel for each platform. All pages, classes, interfaces, etc., that are shared for every platform, are placed in this project. When the Splash screen from an entry platform is finished, the first page is the AllListPage.xaml. This is the Xamarin.Forms Page that represents the cross-platform mobile app screens. 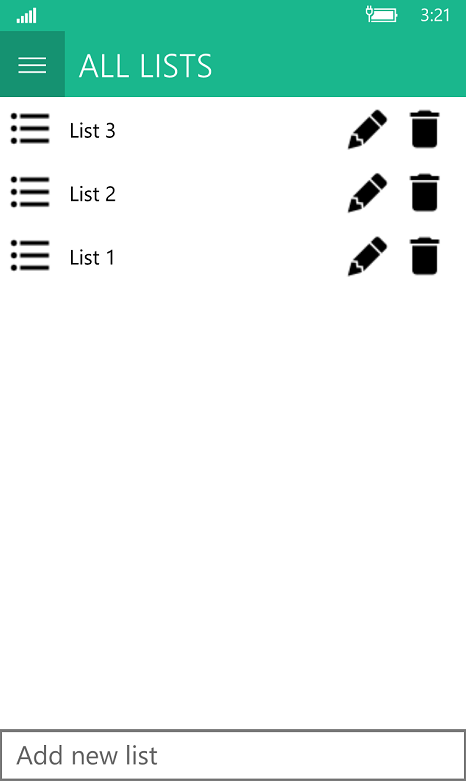 Image 1 - Showing shopping lists. Every list can contain multiple items. Every row in list view contains two action buttons: pencil icon and trash icon. When the user taps or clicks one of them, an appropriate action attached to each of them will be executed. 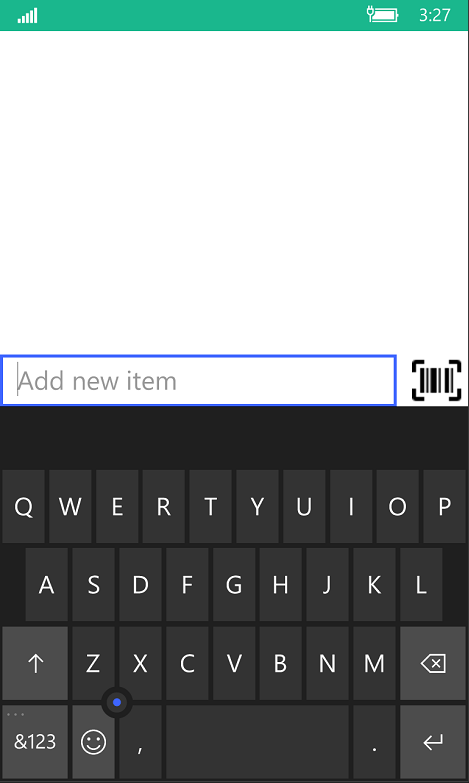 Also tapping or clicking a row will open the list and navigate to the items contained in that list. ListsModel is a class that represents every item in the list view. The Application base class offers the features that are exposed in our project default App subclass. One of the features is a static Properties dictionary that can be used to store data. 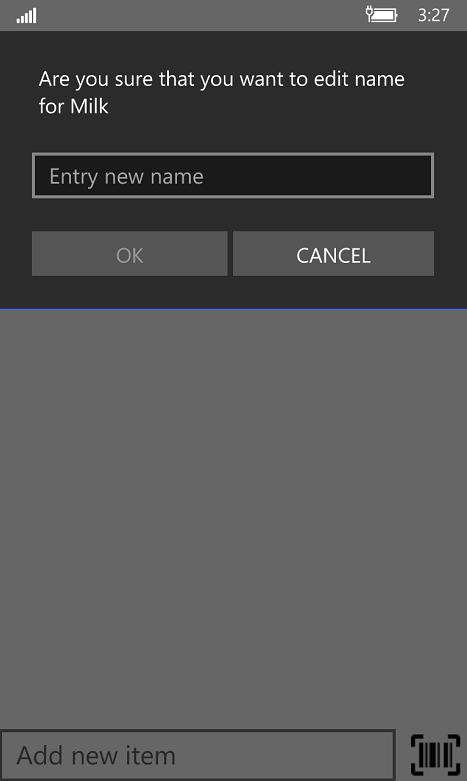 This can be accessed from anywhere in Xamarin.Forms code using Application.Current.Properties. The Properties dictionary uses a string key and stores an object value. Because the Properties dictionary can only serialize primitive types for storage in our case, we need to convert our ObservableCollection<ListsModel> object in JSON format first and then store the value. Notice how at the end of the method we use entry.Unfocus() to hide the keyboard. As we discussed before in this topic, with DependencyService we can use platform-specific functionality from a portable project. Here we are using our native content dialog that we created appropriate for the platform use. For these popups we are using DisplayAlert, a modal pop-up to alert the user or ask simple questions of them. In our case we will be asking for confirmation to delete the list. 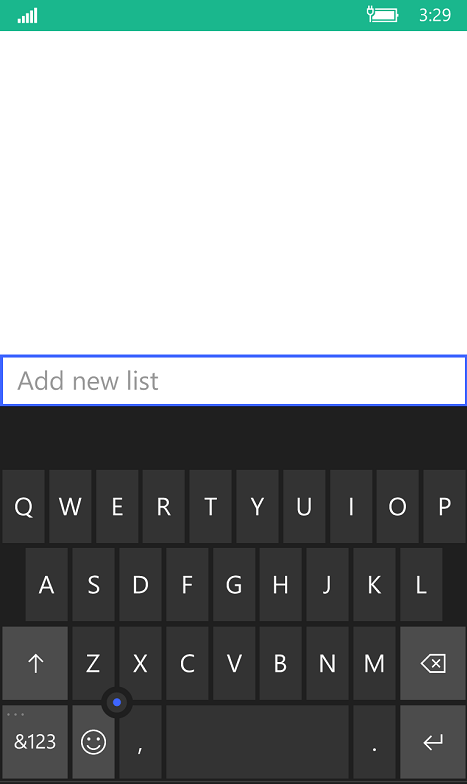 After creating lists, if we tap on the row from List View we can add items to the appropriate list. Same like in lists, you can add, edit or delete every list item. Add a new item by typing the item name in the "Add new item" entry field. The other option is to press on the barcode button in the right corner. When the barcode button is pressed we navigate to the ScanPage.xaml page. This is an important part of our app as it initializes the Barcode Scanner and prepares the app for scanning. We will be using the Navigation interface to manage the page navigation experience. With this code, we navigate from ItemsPage to ScanPage, passing parameters into the constructor of ScanPage. ScanPage is also a Xamarin.Forms page but using a ScanPageRenderer.cs from the appropriate platform we are showing native page for UWP, activity for Droid or UIViewController for IOS in the Xamarin.Forms page. The user can even change the barcode associated with this item. By tapping on the barcode button next to each item they may navigate to the ScanPage and scan a barcode again. ListModel class has a property ActionType that can be Edit or Check. When editing list items or creating new ones, the ActionType property for that list is Edit. When a shopping icon from the navigation bar is pressed, the property is changed to Check, changing the trash icon to the check icon, and the user can check done (bought) items for that list. While in shopping mode, the navigation bar and status bar background colors are changed. Press the Edit list button from the navigation bar to return to editing. 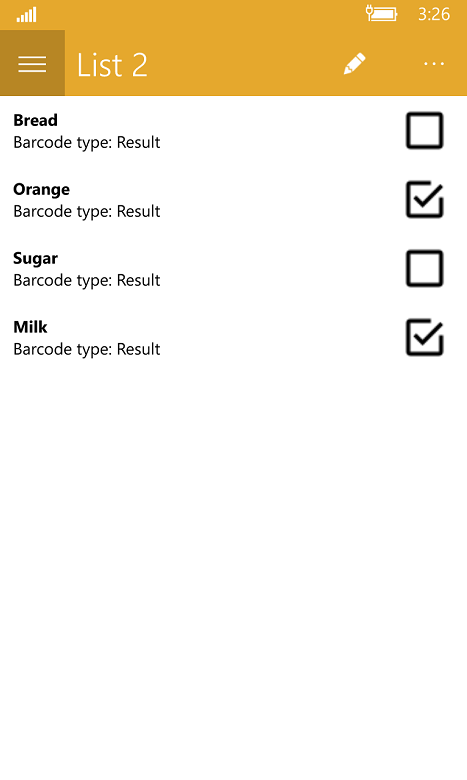 If you followed the instructions you should have an app that can work on Android, IOS, and UWP devices that utilizes the Manatee Works Barcode Scanner built on the Xamarin cross-platform framework. The app enables the user with the ability to create lists, add items to those lists, modify those items, attach them to barcodes, and check-off the same items when done. This app should not be used in production. It is here for tutorial purposes, and maintains only a small set of possible features that a real-life shopping cart app should have. Here we explain in short steps how to make your own Barcode Shopping application with Xamarin that will support Android, IOS and UWP devices. 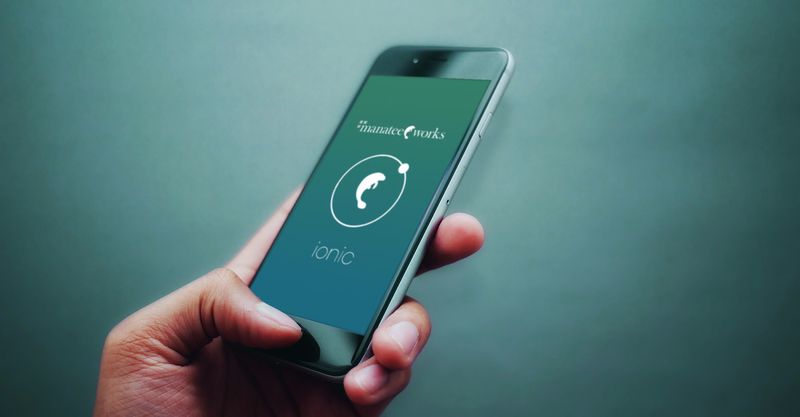 Develop your own Ionic 2 Demo App that utilizes the Manatee Works Barcode Scanner SDK to store barcode scan results in a list. 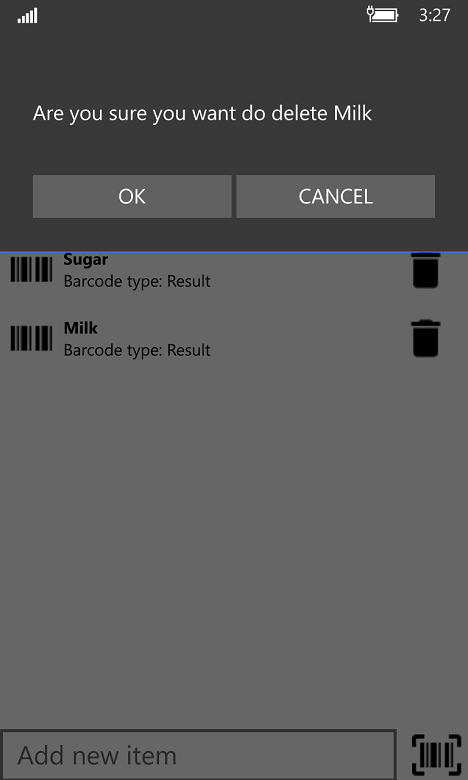 Here we explain in short steps How To make your own Shopping Barcode Scanner application in Android Studio. Take a look at the future of barcode technology, including alternatives in automatic identification and data capture (AIDC).